Kameleon Quilt no 2 "Christmas lasts till Easter"
This quilt displays three totally different flower motifs depending on how the three-dimensional triangles are buttoned. There are two layers of triangles, four big ones on top and eight smaller ones underneath. The pictures below show the three flower motifs. To see how the triangles turn, have a look at this animated version. 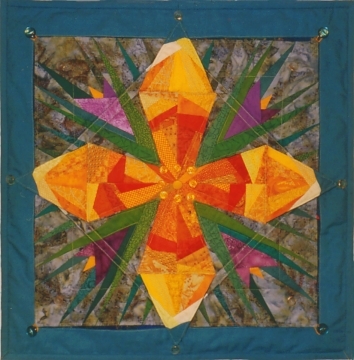 Here the big triangles are turned inwards and buttoned in the center of the quilt. Then we can see the poinsettia, which is a very poular Christmas flower here in Norway. Now the four big triangles are turned outwards and buttoned down in each corner of the quilt. This reveals a spring scene with crocuses and snowdrops. You can see the eight smaller triangles buttoned down near the center. 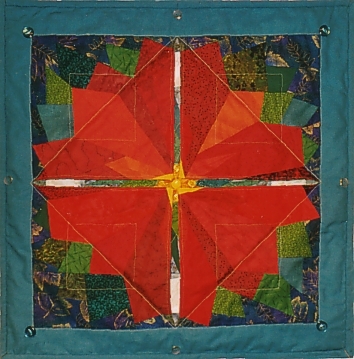 In this picture the eight smaller triangles have been turned outwards and buttoned down near the edges of the quilt. Now we have a daffodil in full bloom. In Norway the daffodil is called "Easter Lily". If only four of the smaller triangles are buttoned outwards, we get a yellow star surrounded by purple crocuses. I like this look for the Advent season. 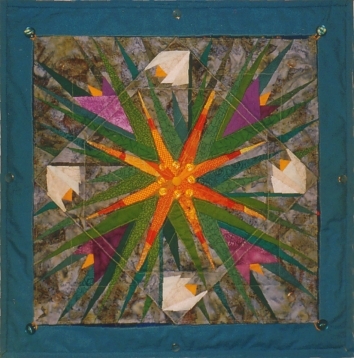 This quilt was originally made as a pillow, but it will also do very well as a wallhanging. The pillow won first prize in a competition held by the Norwegian magazine "Familien" in the year 2000. 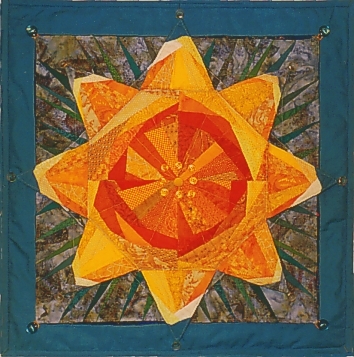 I was very happy to win this prize, which was a ten-day trip to the International Quilt Festival in Houston and to Lancaster County in Pennsylvania. I had long wanted to go there, and I enjoyed the trip very much. I have also written a pattern for this quilt.